Phew! This is the last post in my "How I put together a map" series. If you've sat through all five posts, I thank you! I'll be moving onto another map after this, so don't think this is the end. When we last left off I thought I had a pretty good idea of a surface village sitting adjacent to a cave. But while I liked the concept, I didn't think there was enough 'Wow' factor. In particular, I wanted to have a secret passage extending from the temple on the surface to the cave. And that would be difficult with the previous map. As I thought more about it, I decided that it made sense for the village to at least partially sit on top of the cave. The biggest change on this map was to divide it into two smaller maps. Lots of products do this, both to clarify the individual sections and to accentuate different things. The top map is the 'surface map' , showing terrain, surface structures and the main level of the cave. There's a key (still penciled) in the top right along with a scale. lol. And I just noticed a typ-o in the scale. It should be 1 square = 5 feet. Oh well, Had I pushed this further, I would have done one more iteration of this map to clean up things like that. The bottom map consists of a subterranean upper and lower level. I used red to indicate secret things like trap doors (x in a square) and where different levels connect (via letters - A connects to A). On the top and bottom maps I've also included a profile view - the top map has a profile view of the arch. We can at long last see how my arch differs from the one I showed in post one. You can also get a sense of the plant life - large deciduous trees and numerous hanging shrubs off the edges provide concealment for the lizardfolk defenders. The lower map has a profile view between the room in the upper right hand corner of the lower level and the lower room of the upper level. This chimney is one of several ways to move from area to area that an adventuring party can discover. I'd now like to walk you through the map (an opportunity Superstar entries don't get, by the way). We will start with the longhouse. The longhouse hasn't changed much since the first map - but now its interior is described. There is a center room which holds the altar for ancestor worship. To the south of that room is the office for the cleric in charge of maintaining the shrine. A trap door in the floor extends down to the one on the left side of the Lower Level. To the north of the altar is another room where ceremonial attire and accessories are kept. With the cleric or shaman now occupying an office in the longhouse, the round hut to the south is free for visitors to use. I kept the gardens there partly out of habit but also because they are still convenient for the cleric. Across the path we still have the hut for keeping mounts and north of that we have two additional huts for visitors. The boat launch is still there because occasionally there are nonlizardfolk visitors to this shrine. Lastly, across the river there is a tree whose branches overhang the river. I can definitely see some enterprising thief trying to infiltrate the village that way. The sloping mound has morphed somewhat and a potter now resides above the main cluster of huts. Lizardfolk do not work very much in stone and so a potter seemed more apropos. Following along the top of the plateau we come first across the strangle vines and then to a wood platform hidden amongst the trees that acts as a lookout for the lizardfolk sentries. Turning our attention towards the palisade in the upper left hand corner we follow the path into the cave. The path turns from gravel to hard clay here. We pass a small room high up on the wall where 1-2 lizardfolk watch for intruders coming from either direction and come to a large room. The stream rises from the north wall and to the south there are stairs down to the lower level (A) and up to the upper level (B). The upper level stairs are behind some beautiful tan and white limestone formations. The main passage extends south to a communal area for lizardfolk sentries. Behind that are is an empty room that the sentries rest in. Entering the lower level through A we come to a four-way intersection. To the right leads to the chieftain's room, to the left leads to the priests' area while south leads to the common area. Going left we pass another four way intersection. Up leads to a storage room, down leads to the bedroom of the two acolytes while left leads to the head cleric's room. The head cleric's room has the trap door in the ceiling that connects back to the temple. There is also a secret door that leads to a fungal garden and past that to the back side of a bas-relief face. The head cleric frequently looks through this into the common area to keep an 'eye' on his flock. Taking the right path from the first intersection we come to a room that has three doors. All but the middle are false and all three are trapped. This leads to another corridor which eventually heads to the common area. Before that there is a turn to the left that leads to the chieftain's room. His room has three sleeping areas - one for himself and two for concubines. There is also a trap door leading up from his room to the egg room on the upper level. South of the chieftain's room is another gathering room and a sleeping chamber for his guards. The remaining portion of the lower level consists of the common areas. There are numerous sleeping areas throughout here (wherever there are animal-skin rugs). In the very center is the kitchen, with s secret door that leads back to the chieftain's area. All the way in the southwest is one final passage that leads to pool. This is the lizardfolk's fall-back point. Should the tribe ever be overwhelmed, they all know to fall back to this room. Because, besides being a well, this room also connects to the bottom of the lake. If pressed the tribe flees to the relative safety of the open waters. Lastly, we have the upper level, leading up from (B). This leads first to a large room with a guard monster. I hadn't quite figure out what kind of monster, but it wasn't actually necessary for the map. To pass this chamber one either had to horizontally traverse the wall or drop into the room and then climb up the far side. This led to a passageway which lead to two rooms. The first room housed the tribe's women who cared for the eggs while the second room housed the eggs themselves. That's about it. At this point I only felt there were some small errors in the map. The beds were wrong on the surface. Some of the bushes could have been clarified. Maybe the upper-lower profile should have been longer. But I felt pretty good about this map as is. 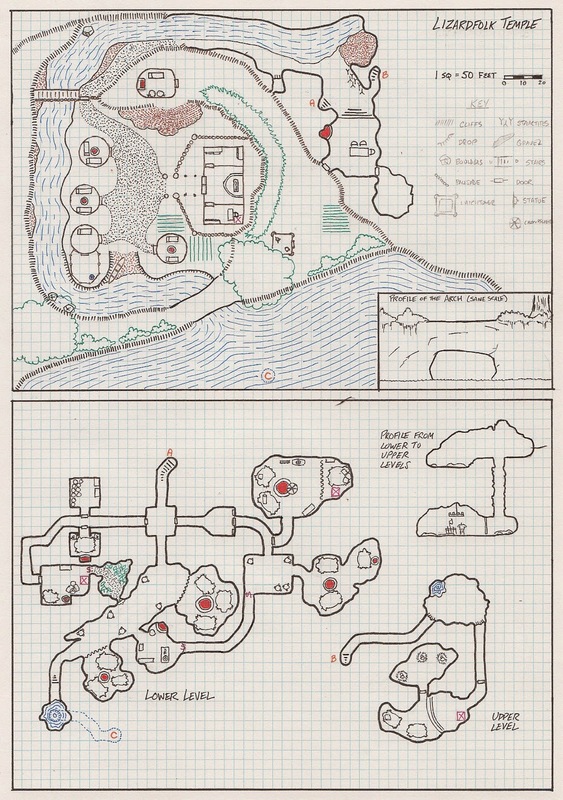 Next time I'm going to drag out a map I did a couple decades ago. Stay tuned!